We hope you'll join us at some of these fun summer events! Saturday, July 25, 8:00pm, Fleas in Concert, Common Ground Coffee House, 33 Crosby Street, Danbury CT. Open mic from 8 til 9pm, Fleas from 9 til 10. Refreshments available for purchase and admission is by donation. Proceeds benefit Danbury Arts in Action. Sunday, August 9th, 10am til 1:30pm, Swing Jam! Bank Square Coffeehouse, Beacon NY. All instruments and listeners welcome. Sunday, August 23, Noon til 5pm, Uke 'n' Brew! Sheffield Town Pavillion, Miller Road, Sheffield, Mass. 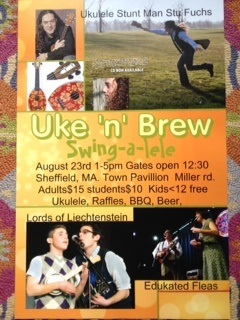 Ukulele performances by Stu Fuchs, Lords of Liechtenstein and us! Beer! Food Trucks! Uke lesson and Jam! Magic Fluke and Flea Market Music merchandise!